Stems tall and canelike from a perennial root, 3 to 6 feet high. Leaves ovate-lanceolate or ovate, blunt or rounded and often slightly heart-shaped at the base, pointed or blunt at the apex, 3 to 5 inches long, the lower ones sometimes lobed, all conspicuously palmately veined, toothed, densely hairy with white stellate hairs beneath, green and finely hairy or nearly smooth above. 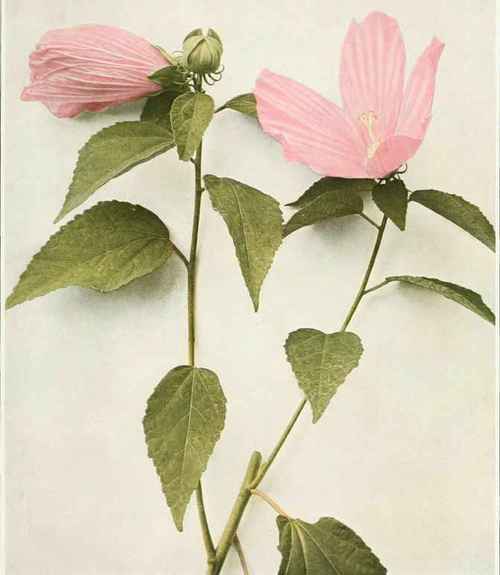 Flowers 4 to 7 inches broad, pink, clustered at the top of the plant; calyx lobes five, ovate, pointed, subtended by several narrow bractlets; petals five, broadly obovate; stamens numerous in a column surrounding the style which is five-cleft at the summit with five stigmas. Fruit a five-chambered pod about 1 inch long, blunt or slightly pointed. In marshes along the ocean or near the coast from eastern Massachusetts to Florida and in saline situations and marshy lake shores inland, especially throughout the Great Lakes region. Flowering in August and September. The Crimson-eye Rose Mallow (Hibiscus oculiroseus Britton) is similar, but the flower is white with a dark-crimson center and the fruit pod is long pointed. It is found on Long Island, Staten Island and in New Jersey.